This post is apart of a potential series I'm doing called the Spoiler Awards. 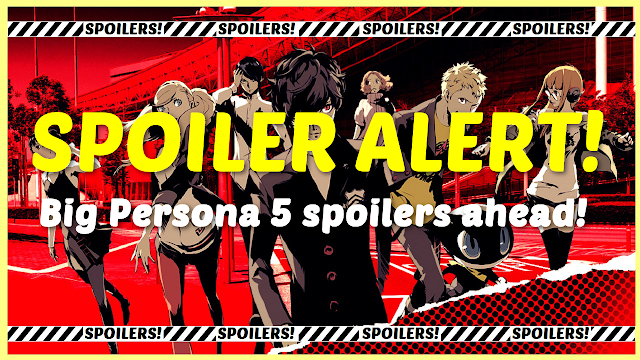 As the title implies, there will be full spoilers for Persona 5 in this, so continue at your own risk! I thought Persona 5 was brilliant and outside of what I said in my review, there were many special moments that elevated the experience for me. 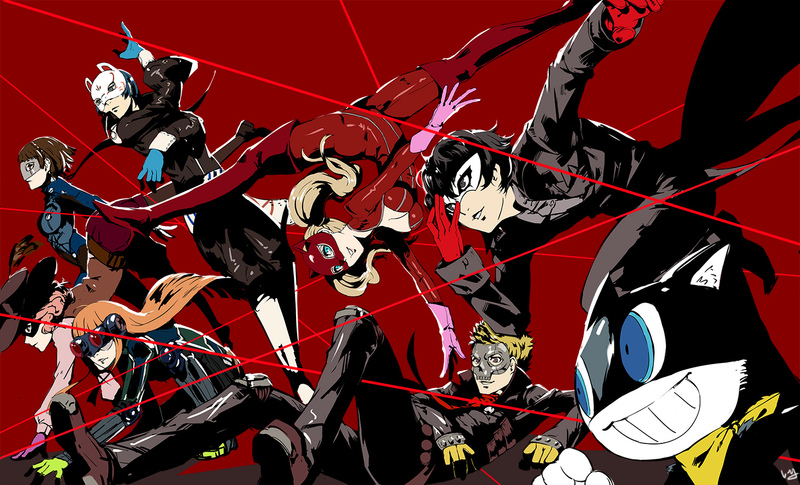 From great dungeons to relatable characters, there are a lot of reasons to love Persona 5. Aside from Best Boy and Best Girl, there were a few things in Persona 5 that didn’t warrant a full post about them, but I wanted to talk about them in some kind of way. So, in what I hope will be a continuing series, here are some things in Persona 5 that I wanted to talk about that are full of spoilers and just for fun, I gave random awards to them. Enjoy! This dungeon was made even better by the social challenges presented to the group by the cognitive people dwelling within Shido’s Palace and how each of the main party members was given a chance to shine in convincing them to let you move forward. My favourite of these was probably Ann’s impression of being a descent of royalty, complete with an accent, and these scenes were a nice combination of light moments and dark ones before the story dove right into ending mode. River in the Desert is a little different to a lot of Persona 5’s upbeat jazz-infused tracks and while I love those other tracks, River in the Desert’s tension-raising beat captured the sense of urgency towards the end of Persona 5 well. I liked the way the start of it was used in Shido’s first form to create a different vibe and how the piece revealed itself as Shido unveiled his other forms. Outside of Persona 5, it’s a fun track to listen to if I need to get hyped up about something and it’s one of the many reasons I need to get the full soundtrack. The fourth dungeon was a definite runner-up in choosing the best dungeon, as it may just be the best story-telling moment of all of the Persona games I’ve played. 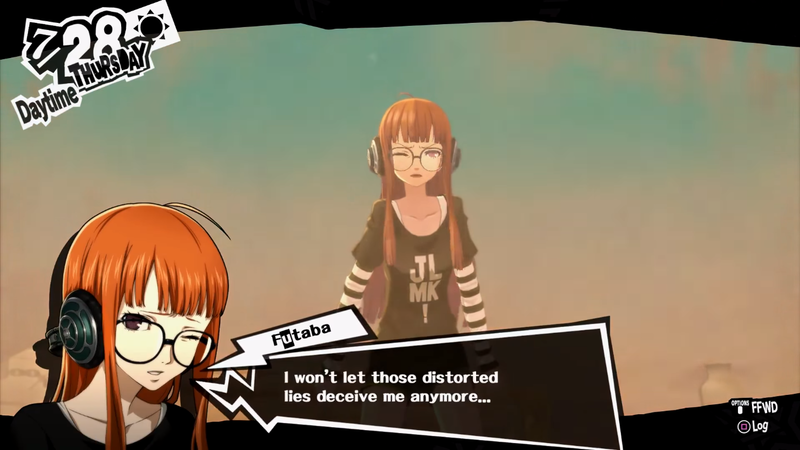 Futaba’s awakening to her Persona was naturally going to be unique as she was the only person to request for her own Palace to be explored, showing she knew something was wrong with how she was. 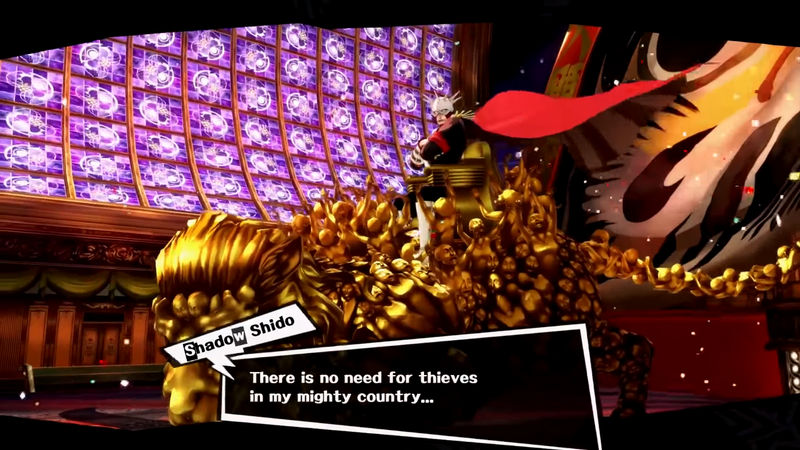 Her use of the Alibaba alias to contact the protagonist to request her own heart to be taken, the Phantom Thieves finding out about her shut-in nature and fighting against that in her Palace fit her cognition perfectly. The puzzles within the dungeons were pretty great too and I thought it was interesting how they all connected to her nature of pushing people away. Unraveling the truth behind her mother’s death and watching her gain her Persona through it was a painful but beautiful experience to watch and after seeing her go through that, it would be hard for me not to hold her in a special light as a character. Apart from her beautiful awakening, Futaba’s social awkwardness is something I found incredibly relatable, and her intelligence and quirky personality also make her endearing. Not to get too personal, but seeing her cower in fear over big crowds or stores full of people is something I can relate to on a certain level and watching her doing her best to overcome those fears also made her kind of inspiring to watch. 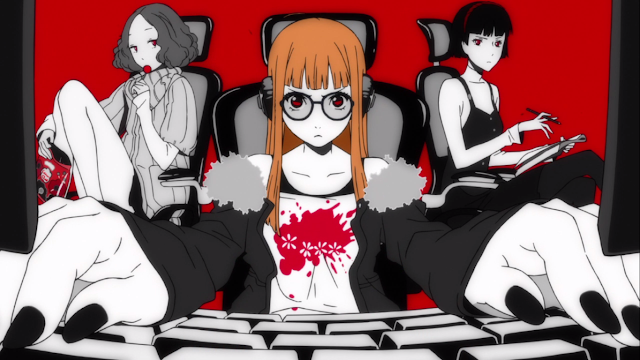 The fact that she dedicated all of her shut-in time into learning hacking and getting smarter to understand more about her mother’s death was also a very admirable thing and in the end those skills makes her an irreplaceable member of the Phantom Thieves. Even though she can’t fight physically in battle, her abilities and knowledge are definitely powerful. Her banter with the other characters as she opens up to them is really amusing too. She marches to her own beat and has her own share of comical moments that made fall more and more in love with her character throughout the story. With smarts, humour, cuteness and a fleshed out backstory, Futaba is a pretty special girl. With how much I liked Futaba, it may be a little obvious that I like quirky characters, so if I’m choosing best boy, it absolutely has to be Yusuke. Yusuke also marches to the beat of his own drum, with the first social encounter with him being unintentionally creepy towards Ann being very funny. 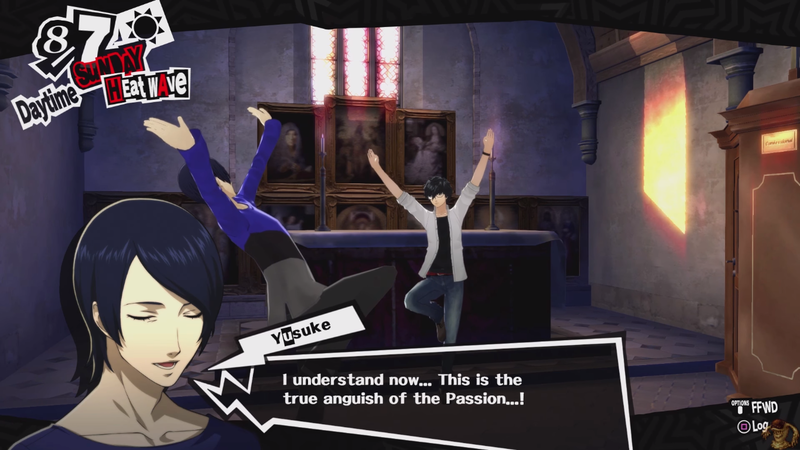 Also, as a creative person I couldn't help but get behind Yusuke instantly watching his pieces get shamelessly stolen by Madarame and it kind of put me on his side from the start as I wanted to see him free from that. Like Futaba, Yusuke ends up being a valuable member of the Phantom Thieves as well. While he doesn’t have the hacking skills Futaba does, he’s very good at considering other angles in their discussions about their next moves and is often good at grounding ideas that won’t work. In contrast to this, his Confidant moments are full quirky Yusuke and the moment he started making poses to embody Jesus in a church in a quest for art inspiration, I pretty much knew he was Best Boy. 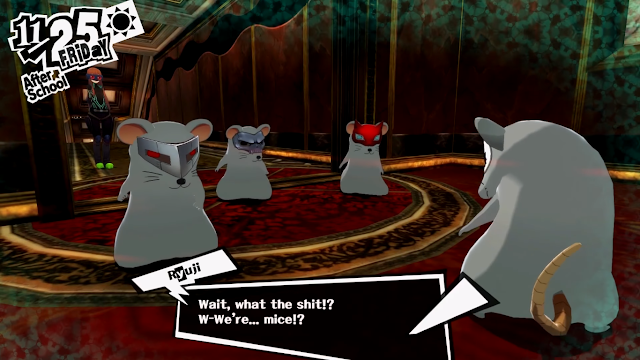 Did anyone else know Akechi was going to betray the party before playing Persona 5? Was I meant to know that from the start? For me, it was incredibly obvious just down to the marketing of Persona 5. 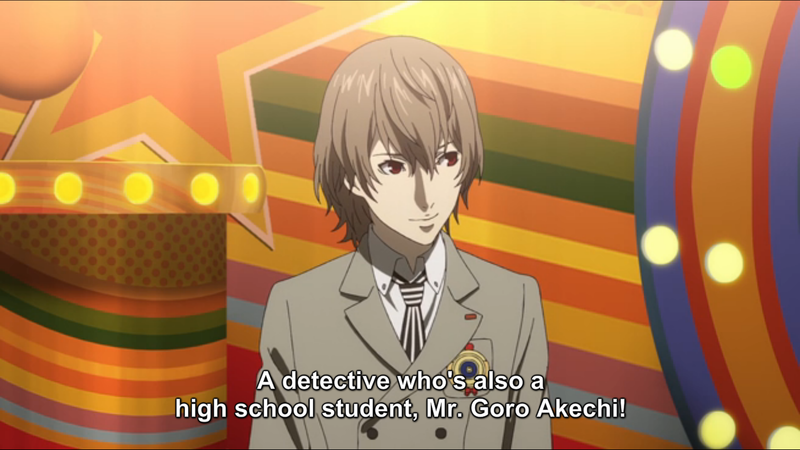 Akechi was announced weirdly separately from the rest of the Phantom Thieves and in the Daybreakers special, he was presented as opposing the Phantom Thieves right from the get-go. While they could’ve been setting the plot up for him to have a less literal change of heart and join the crew, there were other small signs pointing to his betrayal. 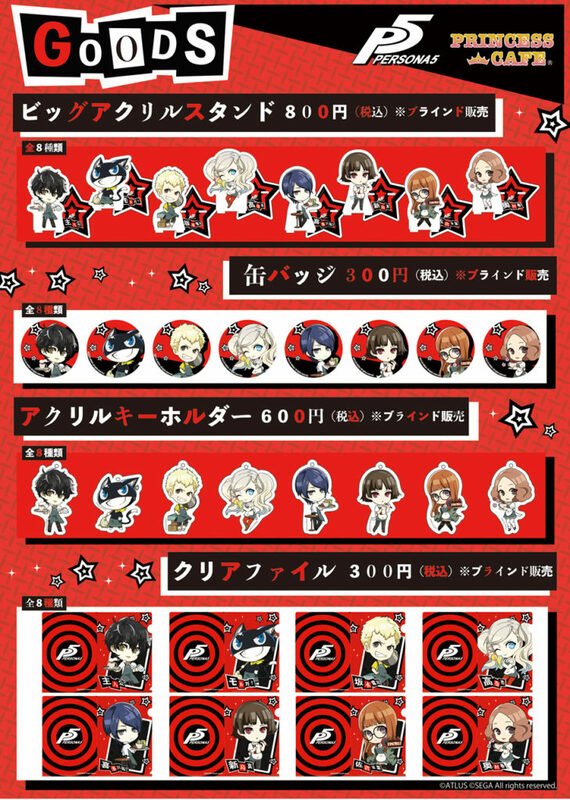 A thing I began to notice in a lot of Persona 5 merchandise was that when it came to sets involving the full Phantom Thieves group, Akechi was often seemingly missing and is still something that happens with new Persona 5 comics and merchandise coming out in Japan. In the game, Persona 5 was slightly more subtle about its betrayer, although not as subtle as Persona 4 was with its antagonist (even though I guessed that one too, it was a least within the story). The points where it was obvious Akechi would betray the group were in that you couldn’t raise his social link by your own volition and his instant warmth to the protagonist seemed a bit off. I actually like Akechi as a character (his final moments were all kinds of heartbreaking), but I hope in the next Persona game if they go down the mystery antagonist route again, they’re a little more subtle about it in merchandising and pre-game advertising. Who would’ve thought a boy whose initial title was ‘Vulgar Boy’ would make me shed a little tear? Throughout Persona 5 Ryuji is mostly a comic relief character, although he does a plenty of moments of passion about his role as a Phantom Thief and does have a genuine desire to rid the world of evil adults. For most of Persona 5 though, he was kind of lacking in a little talent that set him apart from the others in the group. During the Kamoshida Palace, it’s revealed he was previously a star runner in the track team until Kamoshida broke his leg and his Confidant story talks a lot about that, however Ryuji also falls over a lot making it not seem like a great ability for him, until Shido’s dungeon. After Shido takes the Palace-breaking drug and the Phantom Thieves are looking like they aren’t going to make it, the group spot a boat they seemingly can’t reach in time. This is where Ryuji begins a perfect sprint to lower the boat which had me holding my breath wondering if he would fall and he manages to save the group while making it look like he had died. There had been so many big characters dying at that point that I really considered Ryuji being gone, just after he’d solidified himself as being a useful character and putting his friend’s lives above his own. 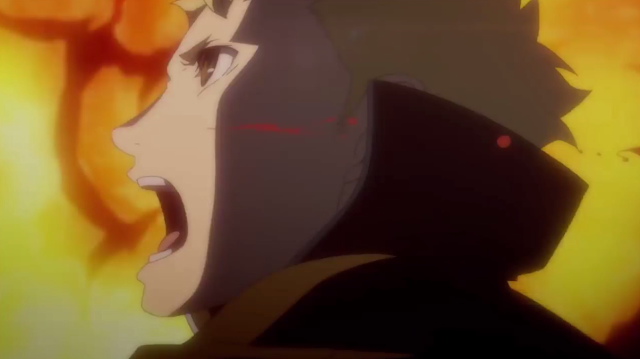 This anime cutscene was really well done and while I was a little mad that my heartstrings were played so well, it totally put Ryuji much higher on my list of favourite characters. I really like the direction Persona 5’s ending took. The idea of changing the heart of the world in Mementos was a pretty spot-on end to a story about changing the hearts of individuals and seeing how significant the fan sites and easily swayed public were in the end was a fitting end to the experience. The only downside is Persona 5 ending at all. I kind of get bummed whenever that end-of-Persona time-skip happens as I was so into my high school life that I wouldn't have minded continuing long after the credits. I'm hopeful that the recently announced Persona Q2 will give us a little bit more in Persona 5's universe with its fantastic cast and story, but for now I'll look back at Persona 5 as my new favourite JRPG. You can pick up Persona 5 at Play-Asia.com! What was your favourite part of Persona 5? Leave your own list of Best Scene, Best Girl/Boy in the comments, I'd love to read it!